Sharpenhoe has already gained a reputation for big X/C flights. This is a tricky site to fly, being a very small shallow ridge and tree covered bowl, with an impossibly flat launch area. The site is owned by the National Trust and we are allowed to fly it subject to the terms of the Site Licence. Hugh Miller has done it again a week later on 2nd July 2018! He has beaten the site record he did last week, this time the flight is logged as 262.0km, landing at Sandford north of Exeter. The previous distance record had been broken a few days before by Hugh Miller, Luke Nicol and Graham Steel, all three pilots with an incredible declared goal flight of 246.01 km on 28 June 2018. These flights beat Hugh's previous site record of 228.2 km set in July 2014. Surely its only a matter of time before the magic 300 km record is broken from Sharpenhoe! Other incredible flights include. Click the km to see flight details. Do not get caught in rotor near the west face if there is a strong easterly. A rough guide is never go behind the hill below 500ft ATO. There is Class-D Airspace (Luton CTA) over the top of the site. The height limit over the hill is 3500ft QNH but rises to 4500ft a few miles down wind. After Leighton Buzzard is Daventry CTA with a FL55 limit. To the south of Oxford is the AIAA with only Brize Norton CTA (Class D) to navigate around. Lyneham is closed, although the CTA (Class D) can be opened by NOTAM so check first. After that the distance record is yours. Always fly with an up to date air map. Avoid Woburn Abbey and the Wildlife Park, as you could land inside the animal enclosures! Wind Direction: Northeast to East (045˚- 090˚). Top to Bottom: 210ft (64m) from the launchpoint. Parking at the site: Do not leave anything on view as there is a history of thefts from vehicles in this car park. Also, obviously, don’t leave things by the car while you take some kit to launch as the chances are it won’t be there when you get back. Directions to the Site. Sharpenhoe Clappers are situated about six miles north of Luton on the A6, and a mile west of Barton-le-Clay. 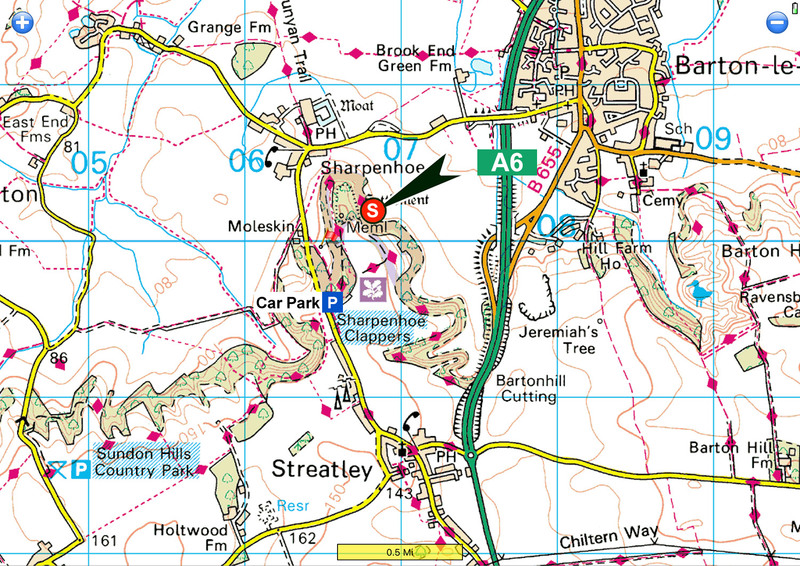 When in Barton take the turn to Sharpenhoe/Harlington and follow the road over the A6 bridge and turn left at the next main road. The car park is at the top of the hill on your left. The site is for Dunstable members only. Strictly no visitors – as required by the National Trust site licence. BHPA Pilot Rating: Pilot (P) and experienced X/C pilots only. No Club Pilot (CP) rated pilots at any time! It’s only to be flown by pilots expecting to fly X/C. This is not a ridge soaring site. No taking off from the launch field when sheep are grazing in it. No top landing where sheep are grazing. The westerly face is NOT to be flown. A maximum of 8 gliders can be rigged on the hill at any one time. Pilots new to the site should always speak to experienced pilots who have flown the site many times before. Class D airspace is above the site at 3,500ft AMSL. Check your airmaps. Most pilots’ reactions on seeing the launch point is disbelief. The ridge is extremely shallow and the small size makes you wonder if it’s actually flyable, but experience has shown it is possible and some great X/C flights have backed this up. The main bowl to your left is totally tree covered and should be treated with respect. Sharpenhoe is not a ridge soaring site, more of a hill to start an XC flight from. The best launch point is a small lump of ground in the middle of the launch field. Rig and set-up sensibly with regard to scrub and launch options suitable for the days conditions. The silver birch to the right of launch is a good indicator of wind strength. It’s often soarable when there is little wind at the launch point. Spend a while assessing the site and conditions before you fly. A good determined run is needed at launch because of its shallow slope and difficult surroundings. Treat it like a nil wind and maintain plenty of airspeed because of the turbulence behind the trees. Always turn left and tuck in as tight to the trees in the bowl as you dare and hope you go up! The marked area (see diagram) has been agreed for use as a top landing area. This field behind take off is 50ft higher than the launch point. The main danger is overshooting into the barb wire fence at the front of the fieldas it starts to slope away. Make sure you have enough height and fly well back before setting up the approach for landing. Be aware that all fences marked by broken lines are topped with barbed wire. Hang gliders are advised to take a crabbing approach to the top landing area to avoid the lee rotor from the hill. The official bottom landing area is marked. To minimise crop damage try to land next to the Barton road. Beware of the power lines crossing the left of the landing field. It’s a difficult field to land in requiring a fair amount of landing skill. Should you overshoot and fly over the hedge row into the next field, land as close to the road a possible and de-rig in the official landing area close to the road. You can walk to the top via the public footpath from the lay-by. Hang gliders especially don’t land in the crop in the field below take off as you will cause untold damage dragging your glider out. In the event of emergency one person at the scene should take charge and delegate another person to call the emergency services and prevent multiple 999 calls of the same incident. Your Club Membership Card, which all members should carry with them, has the British Grid and Degrees and Minutes location references of all our sites to inform the Emergency Services of your location. All press enquiries should be referred to the Club Chairman or Safety Officer. Do NOT speak to the Press directly. Data protection laws prohibit the release of a member’s details without permission. The nearest with a casualty unit is Luton and Dunstable. Drive back to Barton le Clay and join the A6 to Luton. Continue along it for 6 miles into the town centre and follow signs for the A505 to Dunstable. Just over the M1 flyover (Junction 11) the hospital is located on your right. Ordnance Survey Grid co-ordinates for the Car Park are: TL 065 295.